Super Bowl 53 might have been a flop, with the final score 13-3; Patriots over the Rams. And many people didn’t find the Super Bowl Halftime show that exciting either. Maroon 5 preformed at 13 minute set on an “M” shaped stage with special quests, Travis Scott and Big Boi. Oh, and Spongbob made a cameo too. Although an uneventful Super Bowl, exciting news for Big Brothers Big Sisters of America! 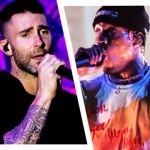 Both Maroon 5 and Travis Scott took their $500,000 and donated it to the cause. The foundation helps underprivileged kids, ages 5 through 18, find adult companions to form a sibling bond. Millions of children need adult role models and this program is a great way to link the two. Children and teens who have a caring adult influence are less likely to get involved in risky behavior and focus on education. Being matched with a Big Brother or Big Sister will help them navigate their problems and help them reach their potential goals. If you have ever wanted to give back to your community, in a BIG way, BBBS of Greater Chattanooga might be the way to do it. Get involved in your community by influencing young people and helping them grow into the future. It’s easy to sign up and register. Classes are done online. And it’s 4-6 hours a month, hanging out with your Little. If you’d like more info on how to become a Big Brother or Big Sister follow the link below..